The Oasis star joined the Irish band for a rendition of I Still Haven't Found What I'm Looking For and a cover of The Beatles hit, All You Need Is Love. 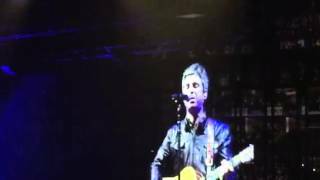 Noel Gallagher made a surprise appearance with U2 at London's O2 Arena last night (Monday 26 October). But what's surprised us even more is the method of travel he used to get there. The Don't Look Back In Anger singer may boast about being in one of the biggest bands in the world, but it seems he's not too big to step on the Tube. According this pic from Twitter user, he headed to O2, Greenwhich, by jumping on the London Underground. The Oasis star joined the Irish band for an epic rendition of I Still Haven't Found What I'm Looking For, from the band's huge 1987 album, The Joshua tree. Then Bono, The Edge and the band were accompanied by the Manchester star for their cover of All You Need is Love - which is no surprise considering how big a Beatles fan he is. Fans were obviously delighted to see Noel on stage, and the O2 was pretty impressed too. And if that wasn't impressive enough, it seems when Noel wasn't on stage with the band, he was only watching them in the crowd with everyone else. Meanwhile, the Dublin rockers are coming in to The Chris Moyles show on Wednesday 28 October. Be sure to listen tomorrow from 6.30-10am to hear Bono live in the studio.